I've got to admit, I was finally excited about a BlogHer Book Club reading choice again. The last several I've done haven't been my typical style of reads or authors I haven't loved, but The Weird Sisters by Eleanor Brown is actually something I would have chosen, on my own, even if BlogHer hadn't sent it to me. In the Weird Sisters, the aptly named Rosalind, Bianca, and Cordelia, daughters of a noted Shakespearean scholar, return to their hometown, ostensibly to take care of their mother, who has been diagnosed with cancer. It's stated in the text, by the sisters' collective narrator role, "See, we love each other. We just don't happen to like each other very much," and none of the three sisters are prepared to deal with the other two upon their return. It's in reconciling their familial roles, their parents, and even the college-centered town in which they were raised, that they are somewhat able to work on their relationships with each other. 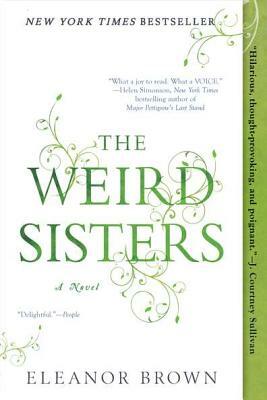 Have you read the Weird Sisters? Would you like to? Have your own weird sisters you need to talk about? (I don't, just one younger brother, so the sister roles in the book were quite interesting to me.) Join me over at BlogHer Book Club to chat about it!